Air Experts serves the Northern Colorado Front Range communities. 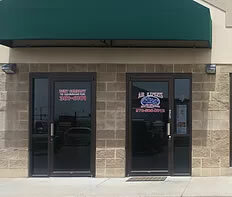 Located in Evans, we service all of Weld and Larimer counties. We repair warm air furnaces, air conditioners, humidifiers and air purification systems. We are dedicated to providing the absolute best repair service, using the highest quality, most cost effective solution for your situation, whether that’s a repair call, direct size replacement, or home improvement project. We can design your system for any new construction project or redesign an existing system to better fit your needs. You can count on us to help you make a sound decision and be there to answer any questions you have. We offer prompt service and we stand behind our work with a 90 day guarantee. All our technicians are fully licensed & insured, and hold the highest industry NATE certifications. Give us a call for a FREE ESTIMATE for any new equipment addition or replacement. For our commercial clients we manage all stages of HVAC that may be part of your project, from the predesign phase of a project through equipment delivery and installation. We are one of the few custom sheet metal shops left in Northern Colorado, which means that all duct work is made to custom fit your project. Tom was very knowledgeable and explained everything thoroughly. We appreciate the prompt and courteous service and his professionalism. Friendly and courteous. Explained the problem and got our AC working again. Highly recommend! Air Experts is equipped to fabricate and install all sheet metal needs. 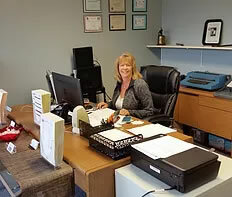 Roberta, our Office Manager, is ready to schedule your visit. Tom, on left, our co-founder and NATE certified Service Manager, is ready to expertly service your heating and cooling equipment to your complete satisfaction. 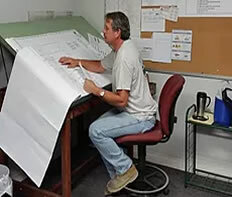 Joe, our co-founder and Installation Manager and Lead Estimator, is ready to deliver quality workmanship and complete, comprehensive and cost effective proposals. 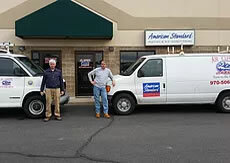 Air Experts expertly services all makes and models in addition to American Standard products. Air Experts, Inc. is a CO Heating, Cooling, Air Conditioning, Heat Pump, RTU, roof top unit, and furnace repair, service, replacement and maintenance company located in Evans, CO. Air Experts, Inc. employs only the best Nate certified technicians for air conditioner repair and, furnace repair as well as all air conditioner replacements, furnace replacements and boiler replacements in Ault CO, Berthoud CO, Evans CO, Eaton CO, Galeton CO, Gilcrest CO, Gill CO, Greeley CO, Johnstown CO, Kersey CO, La Salle CO, Loveland CO, Milliken CO, Severance CO, and Windsor CO. To schedule and set-up a repair service estimate or replacement estimate, call (970) 506-0012. Air Experts, Inc. heating repair service in Evans, CO services all furnace, AC, ductless mini-split, humidifier, filter, thermostat and water heater brands including American Standard, Amana, Aprilaire, A O Smith, Bryant, Carrier, Crown, Daikin, Dynamic, Frigidaire, Fujitsu, General, Gibson, Goodman, ICP, Honeywell, International Comfort Product, Kohler, Lennox, LG, Lochinvar, Maytag, Mitsubishi, Payne, Rheem, Ruud, Skuttle, Trane, Weil McLain, and White Rodgers.